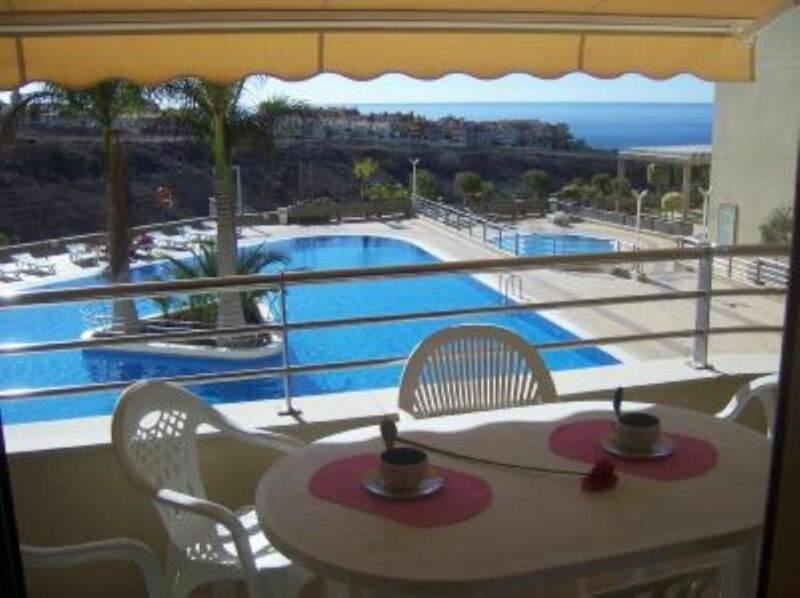 High standing appartment with free interne and sea views, above a fantastic swimming pool, in a stunning complex nearby (300 metres) a new beach! Spacious with everything you could possibly need. Great location. First week in February and the weather was brilliant. Sunshine and blue sky every day. Very specious 2 bedroom apartment. Wifi worked well. Couldn't find anything in English on the TV, however we didn't come on holiday to watch TV so not a problem. Large balcony with sun from breakfast through to about 4pm. Pool area including sun beds cleaned every day. Ideally you need cushions on the plastic sun beds but couldn't find any. Short walk to well stocked supermarket with freshly baked bread every day. A selection of restaurants close by. Titanic Pizza has takeaway which was nice for a night in. We hired a car and visited other resorts where we had our favourite restaurants. The apartment has an underground car park with a designated space. Essential as parking in the resort is a nightmare. We will definitely return. Nice apartment. Ideal for 4 people. Quiet area and cold but nice swimming pool. I recommend the place. Everything smooth sorted without any hassle. Really appreciated the location and the nice pool. Apartment in a beautiful and quiet complex! Good for relaxing. Très chouette appartement dans un endroit calme excepté le manque d'insonorisation du bâtiment. Mais ceci n'enlève rien au charme de l'endroit. Équipement super complet auquel nous avons ajouté un parasol et deux serviettes de plage que nous laissons sur place au profit des occupants suivant. Endroit à recommander. JAMON JAMON à Playa San Juan - show à découvrir absolument le dimanche soir. CABALLO BLANCO à La Laguna - Playa Dr. Olivera 7 - attention il partage la terrasse avec d'autres établissements proches, ne vous trompez pas. Nous avons également eu un super accueil dans les établissements situés en bord de mer entre l'appartement et l'hôtel Bahia Principe. Et nous pouvons dire d'une manière générale que la population est très sympathique partout. Bref, nous avons eu beaucoup de regrets à quitter l'endroit et nous y reviendrons certainement. "endroit calme et d''une propreté irréprochable. piscine propre, nettoyé tous les jours. propriétaire super agréable." On Tenerife there is a lot of differents activities to enjoy: The Loro Park (may be the best animals park in Europe), the shows are unforgettable. The Aqualand (a very big waterpark for children and adults). The carmen Motta Show (one of the bigger Flamenco show of Spain) . You can also discover the dolphins and whales by boat or do Jet-ski and dive on the Atlantic ocean. Near the villa are located karts and quads area. The younger people can enjoy many English and Spanish pubs and discos in Las Americas and Los Cristianos. On the island, you 'll see a lot of very different landscapes (Masca, Los Gigantes, La orotava, Taganana). The visit of the Teide(volcano) and his Lava fields are famous. In the south of the island, the temperature is between 23' and 32ª all year.In the village, you can find all you need:restaurants, bars, a chemist, shops and supermarkets. See you soon! Une caution en cash vous sera demandee lors de votre arrivée d'un montant de 250 euros et remboursable lors de votre sortie. A damage deposit in cash will be requested when you arrive in an amount of 250 euros (or 200 GBP) and refundable when you leave.